This Creamy Chicken and Cauliflower Soup made in the Thermomix is so creamy but completely guilt free. You won’t believe the silky texture that this keto soup recipe has. The chicken is steamed in the varoma with your choice of herbs/spices, making this an adaptable meal for any occasion. Add cauliflower to mixer bowl. Blitz for 6 sec/speed 4/reverse. Add water, stock, pepper to mixer bowl. Add chicken and seasoning of choice to steamer tray and put in place. Cook for 15 min//steaming temperature/speed 2. Break chicken up with spatula and if using butter, add to mixer bowl. Cook for 5 min//steaming temperature/speed 2 with steamer tray in place. Check chicken is cooked and extend time by a couple of minutes if needed. Remove steamer tray, put your measuring cup on and blend 1 min/speed 9, increasing speed gradually. Put soup aside in bowl and add cooked chicken to mixer bowl. No need to clean it! Shred chicken 4 sec/speed 4/reverse. 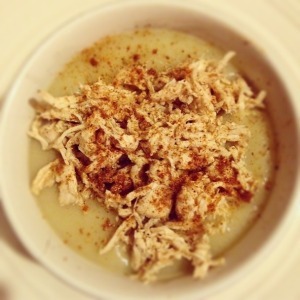 Serve soup with shredded chicken sprinkled on top. Use the blunt blade for this recipe. At step 2 use speed 5 for 6 seconds. At step 5 and step 7 use ST temp if using an Intelli and 120°C or 250°F if using a Supercook. At step 9 SLOWLY increase the machine speed up to speed 9. At step 11 you may need to add a couple of seconds if chicken isn't shredded enough. I have a problem… it’s 4.30 and dinner isn’t til 6. I may not have any left at this rate. Tastes amazing! The consistency is perfect! I’ve been meaning to make this for ages but every time I went to the shops they didn’t have cauliflower (wth?). So amazingly good! Wow. I can not believe this does not have cream or flour. It was so thick and delicious!! This will be a regular for sure. I haven’t got any vegie stock made up. Can i just use a carton one and we are vegetarian will leave out the chicken. Nik, made this tonight for the first time ever… it is absolutely amazing!!! I can not stop at 1 bowl! I followed your advice and used housemade chicken stock and the Mexican spice mix. What incredible flavours this has!!!!! Well done, wish I had of tried this years ago!!! sure this is why. This soup is AH-MAZING! Like everyone else stated, it didn’t taste of cauli, but rather creamy goodness. I’ve got another big batch of (frozen) blanched cauli defrosting. Tomorrow, I’ll make another batch sans chicken, then spread the shredded chicken between 2 batches. (I used 600g and find it to be HEAPS. I’d drop it right back to 300g per batch… the cauli soup is a star in its own right! ) Is make it tonight (the recipe takes no more than 30 mins from whoa to go!) but *whispers* no vege or chicken stock. 😳 If you haven’t made this, DO IT! You will not regret it! I love this, I added a tin of sweet corn and only use 1 chicken breast shredded and parade this as chicken sweet corn soup. It works a treat. Your HCG recipes have literally saved me from cheating!! Am living off the chicken noodle soup, this soup, the slow cooker roast and cabbage salad!! Thank you for another easy, yet full of flavour dish! This has been on my to cook list for a few years now. Glad I finally gave it a crack. So delish, so creamy, so easy!! Yum Yum Yum. Looked at the ingredients and thought “that will be bland as anything” made it anyway based on countless friends raving. Added 4 cloves of garlic and cream. Sprinkled cheese and pork crackle on top to make it LCHF. Made this for the second time tonight. Oh my goodness! This is one of the tastiest yummy soups I’ve ever had. Will be a regular in house now. Thanks Nik you are amazing ! A warning to others making this recipe in their Bellini: wait till the coup has cooled a bit before blitzing for the 1 minute at the end… I just fused my blade to the jug because it was too hot! Oh wow! Made this for the first time and it was so,so delicious! Easy to make, filling, creamy, tasty, healthy, recipe saved!!! Didn’t taste at all like cauliflower though? Ok not fans of this soup not sure why – texture/taste? May try again with some garliic and ??? Made this for the first time last night and can’t believe how delicious it is!! Now I regret not making it sooner! I treasure the data on your internet site. Appreciate it!. Hi, could I please make a suggestion for a tiny tweak to Step 6. OMG HEAVEN ON A COLD WINTERS DAY!! I don’t even like Cauli but this was delicious, so filling and very tasty it was a hit! How do such simple ingredients taste so amazing when combined? This is my new favourite meal! This was so quick & easy, I really loved it …I’ve eaten it for the past 3 days in a row… so good!! Does the soup keep in the fridge ok? For 2 days. Freezes well too! So hubby actually could not stop raving about this soup., I almost had to tell him to just shut up and enjoy it. He has requested it go on rotation at our place! Yum, well done! Thanks Nik! This was delish. I threw a few cloves of garlic into the steamer basket to steam with the chicken (thinly sliced first) then blitzed them into the cauli purée at the end. Oh, and adding Parmesan when serving… Bliss! I don’t normally bother to leave comments on websites but this soup is AMAZINGLY good. I’m doing an HGC protocol at the moment and was delighted with how much flavour this has. I am not a thermomix owner so I just poached my chicken in a saucepan in veggie stock that I had saved from cooking vegetables and used that as my chicken stock base. I boiled up my cauliflower in this stock (and added some onion and garlic) and then blitzed with a hand held blender. Great easy soup. Hubby couldn’t believe it had no cream. Thanks nik. Wow!!! 5 stars. Simply delicious and so easy to make. It’s going to be a regular this winter. I guess you can’t love everything but giving it a go is important. I know! It’s so disappointing when you spend time cooking and then throw it away. This is what I did to make it better…. ALWAYS add the butter. When steaming chicken add loads of sliced garlic, then add that into the bowl when shredding too. I also added a cupful (or so!) of frozen peas while it sat in the thermosever. Much tastier! I’m not sure how the peas will go on the reheat but I’ll let you know! This is what I did…. This is what I did to make it better…. ALWAYS add the butter. When steaming chicken add loads of sliced garlic, then add that into the bowl when shredding too. I also added a cupful (or so!) of frozen peas while it sat in the thermosever. Much tastier! I’m not sure how the peas will go on the reheat but I’ll let you know! Mine was really watery because I used Frozen cauliflower (they’re currently $10 each!) it was very watery so I put a glug of thick cream and another tbsp of stock and some garlic powder in. What a difference. Super delish! Topped it with bacon, pine nuts and Parmesan. I hate cauliflower. As a child my mum and aunts used to try and hide it in everything and I could always taste it. I put this recipe off for so long and finally gave in tonight. SO GLAD I DID!! I made it according to recipe – P2 so no butter – and added 2 tsp of curry powder as I thought this might help to disguise the taste. Well it certainly worked. Another AMAZING healthy recipe. Thank you! This has become a firm favourite in our house. My husband loves this especially and its so quick and easy to do. I freeze it for my husbands work lunches and this year is our year of getting fit and healthy so can’t wait until your new book comes out.. Absolutely delicious! i was a bit worried that the 7yr olds wouldn’t like it but as with all of your recipes they asked for more! This was amazing, I would think it was full of cream if someone made it for me. I seasoned the chicken with sage, onion powder and garlic. I left out the butter and didn’t miss it all all. It will be a regular from now on. I don’t like cauliflower but I totally love this soup! Amazing flavours. So so easy, yet so delicious! I reduced the pepper a little, as the small child isn’t into spice just yet. Great winter warmer and takes no time or effort. Yum! My soup hating husband even ate this because of the addition of the chicken. Very simple to make. Thank you, this was absolutely delicious and so quick and easy! Four out of four children also ate it happily enough. Thanks again! This meal is a staple for me on and off hcg. Sometimes I’ll just make the soup and add things like prawns or other meat afterwards, do versatile and so delicious! Holy Moly Nik!!!! I am a cauliflower HATER, have never liked it, my childhood nightmare. I put this recipe off for that reason, but night 17 on hcg p2, looking for a quick dinner I thought I would try it…. AMAZING!!!!!!! So so so delicious!!! I quartered recipe (200g cauli 200g chicken etc) for two hcg meals, but think it will be best to stick to full recipe in the future. I stuffed it up (in my hungry haste) and put chicken into simmering basket instead of steaming tray, it cooked in the 15 minutes and was still perfect. I made this in my Bellini Intelli. It needed an extra 10 minutes to cook the chicken, but it was worth the wait! This is a fantastic recipe! This is one of the yummiest meals I’ve made in my Thermomix. Both hubby and I love it and have made it many times! This soup is so delicious. I tend to use a bit less chicken and it makes about 5 serves. Simple, fast to make and delicious. What more could you want! Didn’t bother with the chicken, really felt I didn’t need any extra flavour. This soup is amazing! Great soup, makes a large amount. I eat more of this than another food!! I love this soup so much…..Is the yummiest soup ever. Its awesome with the chicken or as a variation for the LCHF crew I do the cauliflowers soup and fry up some chopped bacon in ghee. I then top the portions of soup with a couple of slices of butter, parmesan and bacon. I LOVE this soup!!!!! Took this to work to share and everyone LOVED it! So easy to make and love that there are only a few ingredients!! Lovely soup. Not being a huge cauliflower eater I wasn’t sure what to expect and I was amazed at how creamy and tasty the soup was without the addition of any cream. ( I did add the butter and I made and used the mexican spice ) I am glad I gave it a go and will definitely make it again. My 11yo , who doesn’t eat soup was happy to give it a go and we are having left overs for dinner again tonight. My own lack of thermo lingo had me placing the chicken in the “dish” not the top “tray” and needed to cook chicken a little longer but I will nail it next time. Seriously haven’t had a bad skinny mixers recipe and this did not disappoint. Thanks!! This soup is devine and way too easy to make. Don’t hesitate just make it. You won’t be disappointed. Just made this for dinner tonight and had a quick taste test. This is delicious and so easy to make. Thanks for another great recipe. Far out! This is amazing soup! Devoured by husband, 2,5 & 7 year olds too! Yummo!!! Miss 14yr said it was the best thing she has ever tasted. So easy to do. I needed to cook the chicken for another 5mins. Thanks again for another great recipe!! Delicious!!! Thank you so much. My Cauli hating son just ate a whole bowl of ‘chicken soup’! WOW this soup is so creamy and yummy!! I love the flexibility of this one – add any spice to the chicken and yum! I used chicken thigh and though it was delicious. Will definitely be a regular. This soup is so awesome. It’s very easy and is perfect for calorie watching and has a good amount of protein. It’s great for lunch or dinner, and freezes well. Plus it’s so so yummy! I don’t even like cauliflower, but think I’d have an anxiety attack if I didn’t have some made up in my freezer or at the very least the ingredients in the fridge. Also have found it good when I’ve had a cold and decreased appetite as very warming and nutritious. I’ve had a cauliflower sitting in the fridge for almost 2 weeks! (GASP- I know it’s crazy that I haven’t used it up yet). It’s a cold and wet day today, so I knew exactly what I wanted to do with it. Cue Google “skinnymixers cauliflower soup” and less than 20minutes later I’m sitting down with a big bowl of creamy wholesome soup. Wonderful Nik!! WOW, WOW, WOW!!!! I cannot believe how creamy AND tasty this soup is! Thanks for yet another amazing recipe. You’re a superstar! So tasty and simple! Enjoyed by 2 10 year olds, even the fusspot, not soup lover smashed it down! Both are equally besotted with the Mexican seasoning. Delish! Seriously delicious! Hubby & Mr 13 didn’t seem keen when I told them we were having soup for dinner so I made it as an entree and prepared veggies & meat as a main. We didn’t make it to the main … The boys loved the soup so much they went back for more and were full up! The chicken makes it more substantial plus I served with home made garlic bread. I’ve since made it again but with different veggies as I was low on cauli and it still worked a treat – I used a mix of cauli, carrot, sweet potato & zucchini. Delicious! Thank you!! I was surprised that with so few ingredients that this soup is so tasty. Definitely in my top 3 soups ever. The chicken takes it more into the meal category for those people who don’t think soup is a meal by itself. This is!! Great Soup! I have been having this everyday for lunch (and sometimes dinner) for the last month – still not tired of it! So good. Delicious soup with or without the chicken! A staple for winter lunches on cold days!! Freezes and reheats easily as well! Yummo! I didn’t have any chicken so I made it without that and consequently no seasoning. Still awesome. Just yum yum yum…. super delish. Made in the morning for a super quick supper later that day and it reheated beautifully. Kids & hubby scoffed it down, no complaints. Onto a winner with this one, will be a regular in our household. The soup was creamy and the chicken moist and tasty. Surprisingly good. This was so easy and extremely flavoursome. The entire family loved it and it will certainly be a regular dish on our weekly menu. Just made this in my Kitchenaid Cook Processor! Was a bit worried as the Kitchenaid will not let you steam and stir at the same time but worked out perfectly! Simple yet amazing! The whole family loved it, including fussy 3&5yo! Great to take to work for lunch! Minimum ingredients = maximum taste. Yumm, devoured by all. Thank you. Such a tasty soup for hardly any ingredients. Love it!!! Loved this Nikalene – thank you. Delicious, creamy & filling … & I dont like cauliflower! Lol. Hubby said he liked it better than the Rockpool Cauliflower & Parmesan Soup! Sooo unbelievably creamy! Delicious, filling and low cal!! I loved how easy it is to achieve such a creamy tasting main meal soup. I’ll be making this again; my Family thoroughly enjoyed it. Thanks Nik, (again…another one of ‘Nik’s dinner’ added to the list)! Made this today soooo yummy! Made the spice, didn’t have majoram but used bit extra oregano, fantastic!! Got a whole big bowl for lunches this week, another awesome receipe Nik! Would you reduce cooking time if not using chicken, or using pre prepared chicken? next thought- add a splash of coconut milk. can’t hurt. I got excited about the positive comments, but when I tasted it , disappointed. Hot at all creamy – follow the recipe exactly but there was no creaminess. This was completely gorgeous – devoured by all four of us (no leftovers!). Next time I’m going to try some really crispy bacon bits on top. Dinner winner. Never thought so few ingredients would taste so good. I used left over bbq chicken that I seasoned with skinnymixers mexican spice mix. Will definitely be making this again. Delicious! Thanks again Nikalene! I was looking for something other than vegie soup for my healthy eating plan – and this fits the bill beautifully. Lovely velvety soup. Was a bit worried it may be a bit bland and that I may need to add garlic, nutmeg etc…nope! An easy and tasty meal thank you do much! Hey silly question. Is the Mexican mix just used to sprinkle on top at the end or used on the ch icken when steaming it in the varoma? What a delicious creamy soup (without the cream) with the added benefit of the spicy chicken. This has become a favourite “go to” meal. So so good! Wish I had brought 2 serves to work with me! I usually don’t like cauliflower but had some in the fridge and whipped this up. It was delicious. Definitely something I would make again. Thanks for another awesome recipe. This soup is so delicious. Takes no effort either and so easy to whip up. I just made the soup part, didn’t have any chicken but by itself even it was delicious. Worth trying! I’ve had this on the must do list for quite a while but I was inspired this week because I saw a few posts. Beautiful soup Nikalene. The whole family loved it, especially my fussy 9 year old. I was amazed so few ingredients produced such a great result. So glad I had the mexican spice mix made up and ready to go. Thanks again for sharing your passion and hard work with us. Beautiful! So easy and quick for a perfect meal. I made this today and it was fabulous! Everyone loved it, thanks so much! So delicious and so easy to make. Thank you! Oh my goodness this is the yummiest soup! Thanks so much! Just wow! Hit the spot after a heavy training session tonight. Quick, easy, super healthy, light but very fulfilling. This will be made again and again! Yum! So filling and so so creamy! This is an amazing recipe, one of my favourites. Helps me get through lunches at work on HCG and not feel like reaching for something else! A perfect recipe. Quick, easy, delicious and the kids loved it. Thank you! Who knew cauliflower soup could get so creamy? I seriously doubted the flavour of this soup without garlic or onion and it was amazing without. So quick, and the added chicken was delicious. Hubby kept checking if it had cheese in it! This was very easy to make. Just whipped up a batch for lunch. Don’t feel deprived at all with a tasty lunch like this. Thank to Nik! This was the first Skinnymixers recipe I have tried. I didn’t have a chance to pre prepare the Skinnymixers chilli, so I used Mexican chilli I already had. Not only was it so simple to whip up, it was delicious!. Thank you! One of my favourite recipes!! ive accidentally made it with thigh and didnt like it as much so definitely use it with breast as the recipe says – the spice mixture in it gives it an awesome flavour and stops it being too plain! Well what can I say, she’s done it again. Every dish I try is amazing! This one is making my weekly lunch menu for sure. So quick, so simple, yet so delicious. Know one would know it has no cream, because it’s so creamy! Love it!